Share What You Love and the Ribbon of Courage are a perfect match. They are both about supporting the people around you. Some of you probably already know that I was one of the unlucky people to be hit by Breast Cancer. I was diagnosed almost 6 years ago now, and am blessed every day that I am still a survivor. One of the things I have found is, because I am very open about my cancer history, people will share their stories with me, so I think I am now more aware of other people who have been hit by this. I am always happy to help these people, and their families, but just being around if they want to talk. I recently heard of someone local to me who has been hit by this, so I wanted to drop a card in to her to let her know that I am here if she needs me. Even if all she wants is to know that there is someone there, I hope that it will help her to know I am around for her. I really did not need to think very long about how the card was going to come together, Share What You Love and Ribbon of Courage were the obvious choice. I love that the Share What You Love bundles all include free items, you can see all the details in the Current Offers section of this site. Remember that the Ribbon of Courage is available as a Bundle, with 10% off the combined price, but both this Bundle and the Share What You Love Bundles are only available until the end of May, so if you want to save money, you know what to do!! If you buy any of the Share What You Love Bundles from me in May, in addition to the usual Gifts and Thank You Card etc. you will also get a selection pack of retiring Designer Series Paper (cut to 6 x 6 in mixed packs) AND you will get entered into my Prize Draw!!! To make sure you never miss a blog post, please subscribe to my blog by email. Just pop your email address in the box on the sidebar of this page (below the social media links), go through a couple of standard security bits (to protect YOU), and you will get an alert in your Inbox every time I post! To share in the Hostess Rewards for this month AND become a VIP. If your order is over £150 (plus P&P), please don’t use the Hostess Code as you will get to pick your own rewards, but don’t worry, you will still become a VIP Reward Member. 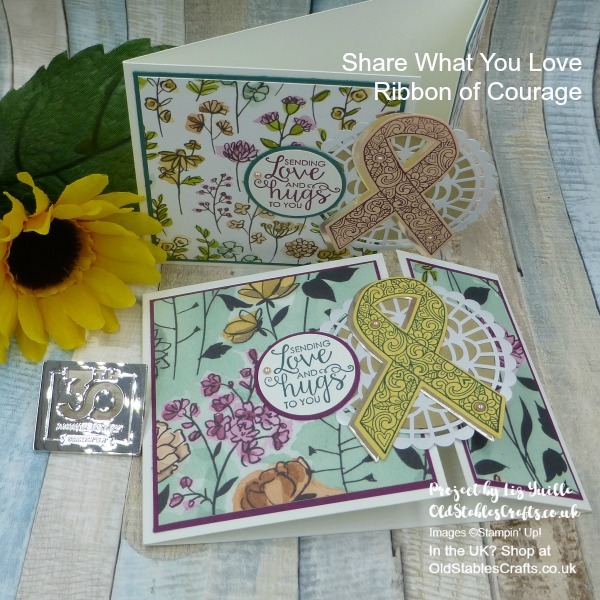 This Ribbon of Courage/Share what you Love card you made is really pretty! You always have very creative ideas, and I love your website! Congratulations on being a cancer survivor!! Yeah! !